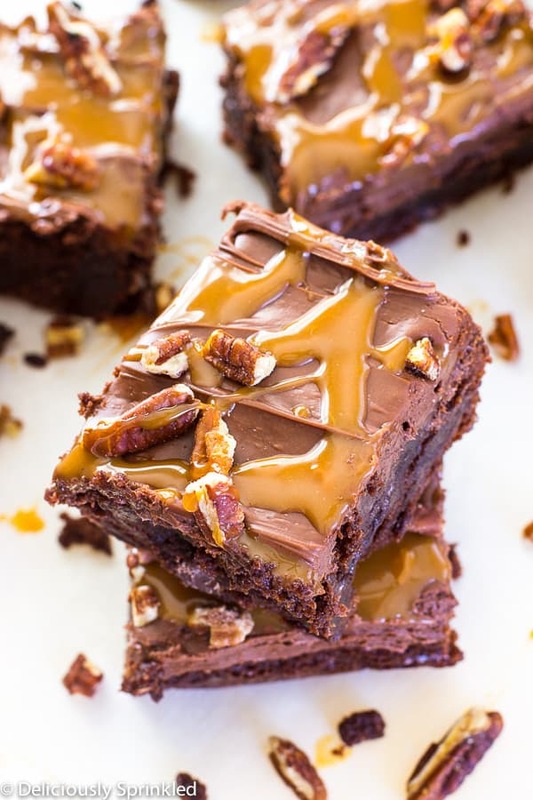 These Frosted Turtle Brownies are thick and fudgy topped with milk chocolate frosting, caramel sauce and chopped pecans. Hi everyone! It’s Jenn from Deliciously Sprinkled back with a delicious Frosted Turtle Brownies recipe. 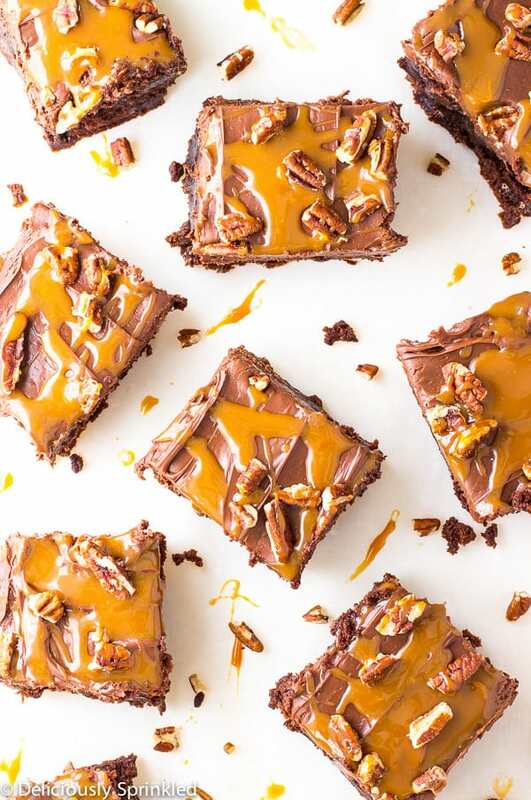 I didn’t think brownies could get any better until I topped them with homemade milk chocolate buttercream frosting, drizzled with caramel and sprinkled with chopped pecans. 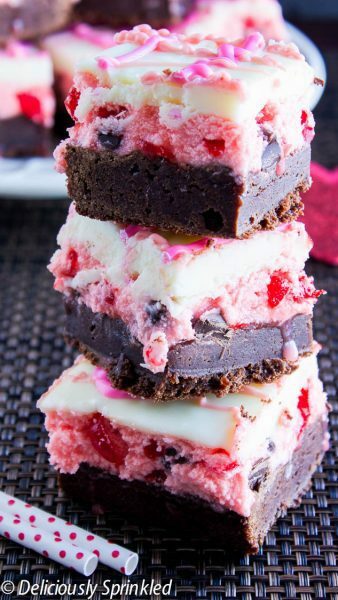 Seriously, these brownies are AMAZING! 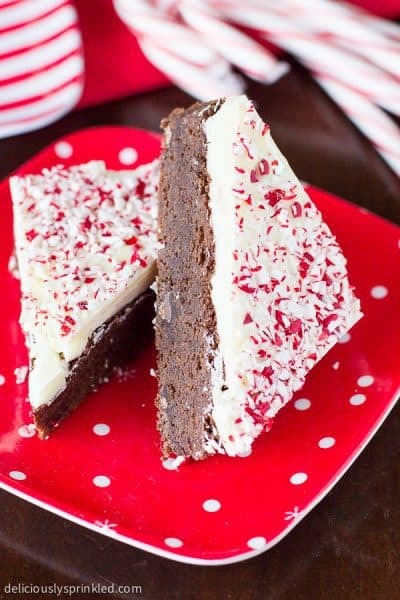 These brownies are super simple to make because I used my two favorite boxed brownie mixes, that’s my trick for homemade tasting brownies without all the work. And with the holiday season kicking off next week with Thanksgiving, I’m all about quick and easy desserts that taste and look like you have spent hours in the kitchen. So if you’re looking for an easy and delicious dessert to bring to Thanksgiving or an upcoming holiday party, these Frosted Turtle Brownies are sure to be a huge hit. Preheat over to 325F degrees. Line 9x13 inch cake pan with aluminum foil and spray with non-stick cooking spray. Set aside. In a large bowl, using an electric or stand mixer, mix both brownie mixes, water, oil, and eggs until combined. Pour brownie mixture into prepared pan. Bake for 40 minutes or until toothpick inserted into the center comes out clean. Let brownies cool before frosting. MAKE FROSTING: Place milk chocolate candy bar into small bowl. Microwave for 30 seconds intervals, stirring after each interval until the chocolate is melted and smooth. Set aside and allow to cool. Using an electric or stand mixer, cream together butter and powdered sugar together until light and fluffy, scraping the sides of the bowl as needed. Add heavy whipping cream and vanilla extract, and mix until combined. Fold in milk chocolate until fully incorporated into the frosting. Frost cooled brownies and sprinkle with chopped pecans. Place brownies in the fridge for about an 1 hour. In microwave, melt the caramels with heavy whipping cream; stir until smooth. Drizzle over brownies. Cut into squares. 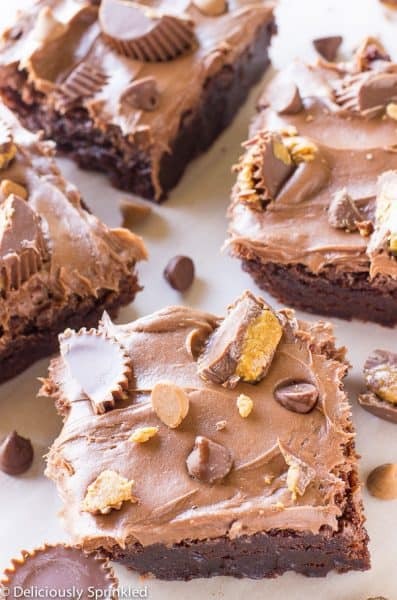 Those Frosted Turtle brownies, YUM, crunchy fudge, and gooey are some of my favorite attributes of a good brownie. And add in the caramel I’ll simply be in heaven! It’s settled, I’m headed to the store to pick up ingredients to make these TONIGHT. In the recipe it says to use 12 caramels, but in the pict you show using the caramel bits. My question is, did you use the caramels wrapped in plastic or did you use caramel bits? I have a bag of the bits, but no wrapped. I live in Mexico and can not get either here, but my best friend brought me 3 bags of bits. Please email me your answer–I am ready to prepare these tomorrow!! Absolutely you can use the bits! I used the 12 caramel cubes just as a reference point but used the bits myself for convenience!